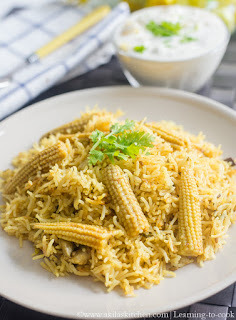 Baby corn Biryani Recipe – This biryani has become one of my favorite in recent days. If I didn’t prepare any non veg biryani, then I choose to prepare this biryani. The crunchiness of the babycorn makes the recipe more yummier. Everyone in my family loved this and my lo’s were asking for the babycorn more than the rice ☺. 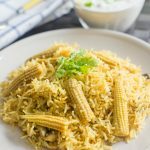 I have baby corn Pulao posted already in the blog which I can say is a simpler version of this Babycorn Biryani. 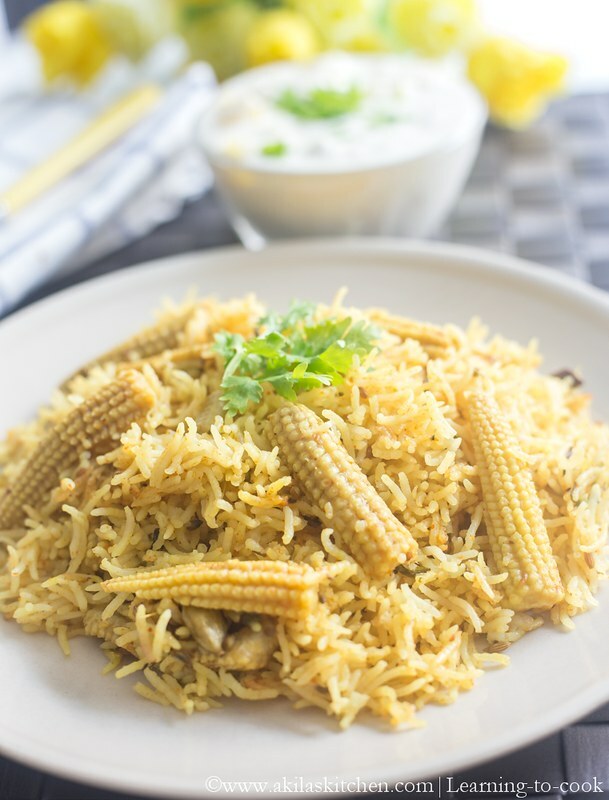 Though it is not prepared in the traditional way of preparing Biryani, it still tastes great. 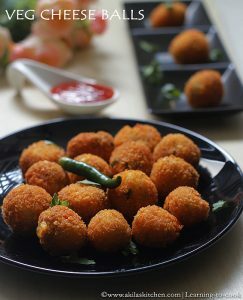 You can check other pulao and rice recipes here. Some I have given below. 1. Soak the rice for 20 to 30 minutes. Strain and keep aside. Heat the pressure cooker or a big vessel. Add 2 tbsp ghee or oil. When it is hot add the spices mentioned in Spices to add. When they start spluttering add the onion, green chilli and salt. 2. Add the ginger garlic paste and sauté them till the raw smell goes off. Add the chopped coriander and mint leaves. Sauté then till nice aroma comes. 3. Now add in the babycorn and little turmeric and sauté for 5 min in medium flame. Add the biryani masala and mix them. Sprinkle little water now. 4. When the babycorn is well coated with the masala, add the coconut milk and water. 5. When it starts boiling, immediately add the rice. Give a stir and close the pressure cooker. Let it cook in slow flame to 10 to 12 minutes and switch off the stove. 6. When the pressure completely goes off open the lid and add the remaining ghee. Give a stir slowly without breaking the rice and close the lid again for another 5 minutes. 7. 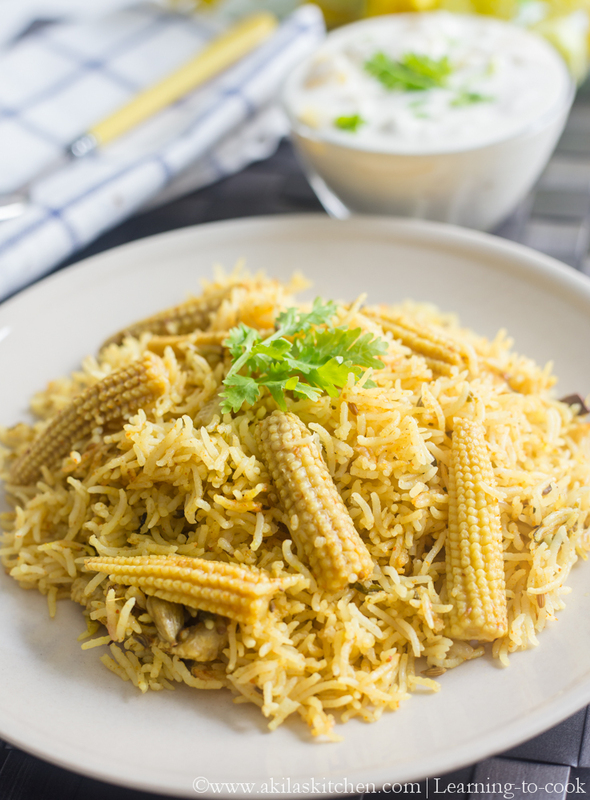 Now open and serve the hot hot babycorn biryani with Aloo Raita ☺. 1. The timing for the pressure cooker depends on the cooker make. Check for the manual if in doubt. Normally 10 to 12 minutes should work out good. 2. 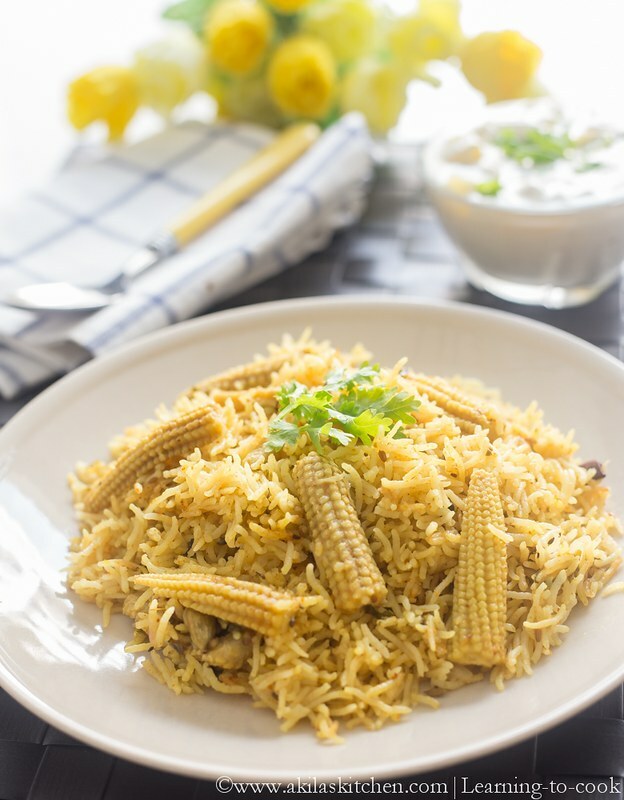 I didn’t add any Chilli powder and garam masala in this as my kids feel it will be spicy and also the biryani masala which I use gives correct spiciness to the biryani. If you don’t have biryani masala, then replace them with Chilli powder and garam masala and adjust accordingly to your taste buds. This biryani has become one of my favorite in recent days. If I didn't prepare any non veg biryani, then I choose to prepare this biryani. The crunchiness of the babycorn makes the recipe more yummier. Soak the rice for 20 to 30 minutes. Strain and keep aside. Heat the pressure cooker or a big vessel. Add 2 tbsp ghee or oil. When it is hot add the spices mentioned in Spices to add. When they start spluttering add the onion, green chilli and salt. Add the ginger garlic paste and sauté them till the raw smell goes off. Add the chopped coriander and mint leaves. Sauté then till nice aroma comes. Now add in the babycorn and little turmeric and sauté for 5 min in medium flame. Add the biryani masala and mix them. Sprinkle little water now. When the babycorn is well coated with the masala, add the coconut milk and water. When it starts boiling, immediately add the rice. Give a stir and close the pressure cooker. Let it cook in slow flame to 10 to 12 minutes and switch off the stove. When the pressure completely goes off open the lid and add the remaining ghee. Give a stir slowly without breaking the rice and close the lid again for another 5 minutes. The timing for the pressure cooker depends on the cooker make. Check for the manual if in doubt. Normally 10 to 12 minutes should work out good. I didn't add any Chilli powder and garam masala in this as my kids feel it will be spicy and also the biryani masala which I use gives correct spiciness to the biryani. If you don't have biryani masala, then replace them with Chilli powder and garam masala and adjust accordingly to your taste buds. A perfect fit for our veg meals. Oh-yum.